Dromnibus-Inclusive Education is an application that aims to support the learning of basic skills. Specifically made for children with developmental delay and autism, the app supports children following Applied Behaviour Analysis programs. ABA comes from a branch of science called behaviour analysis and ABA programs have been successful in bringing about positive behavioural change for people with autism and other needs. 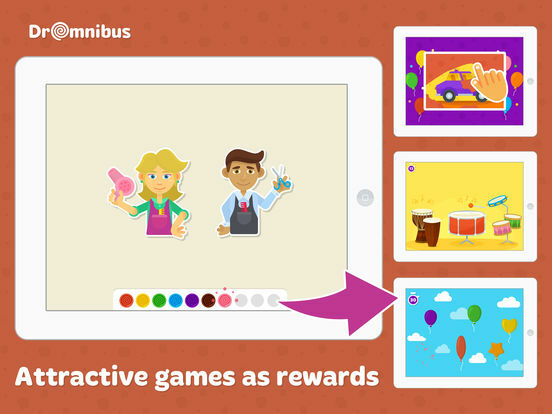 Dromnibus-Inclusive Education is a delightful app that motivates and supports learning in an efficient and friendly way. In order to access the app, you are required to register to set up specific profiles. In doing so, you are given 14 days free before you can subscribe to access the full features of the app. The free trial gives you a good taste of whether or not it is suitable. You can then decide to subscribe to a 1 month, 3 month or annual option. The user interface is child-friendly and extremely easy to navigate. The app is nicely sectioned into relevant categories like; cognitive, mathematical, nature and social. By clicking on these relevant areas, you can narrow down to the area you want to work on such as colours, shapes, vegetables, fruits, numbers, emotions and professions. The developers continue to add further areas with each update. There are two options to choose from in each area, 'Learning', where initial basic skills work takes place and 'Improvement' where the child can generalise what they have learned. At the end of each activity, there is the option of playing intrinsically motivating games. The children in my class loved this feature especially. Dromnibus-Inclusive Education can adjust the level of prompt depending on the ability of the child which is excellent for personalised support and differentiation. I feel the level of prompting and delay really works in all areas of the game allowing for good progression. The verbal instructions and voice coach are clear adding to an excellent user experience. I have really enjoyed trialling Dromnibus-Inclusive Education, once you have registered you can start using immediately with little difficulty. At first, I felt the subscription was a little pricey, but when you see what full features are available and the apps potential benefits, it is relatively inexpensive for what you get. I will definitely be recommending Dromnibus-Inclusive Education to the parents and staff at the school. Well done! An app that aids the therapy and education of children with behavioural and developmental disorders, such as autism (ASD), Asperger syndrome, ADHD, Down syndrome or cerebral palsy during preschool and early primary school education. 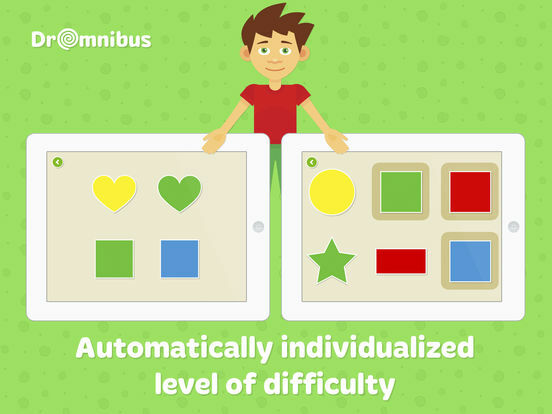 DrOmnibus Inclusive Education automatically adjusts the level of difficulty to the capacity of a child with autism, ADHD, Down syndrome or cerebral palsy. The tool is based on Applied Behaviour Analysis and allows parents to support the therapy of autism and other disorders at home. It can also be used by therapists during therapy sessions. The app develops basic skills useful at school, which makes it an effective educational aid for the teacher. - an organiser for the parent, therapist and teacher. 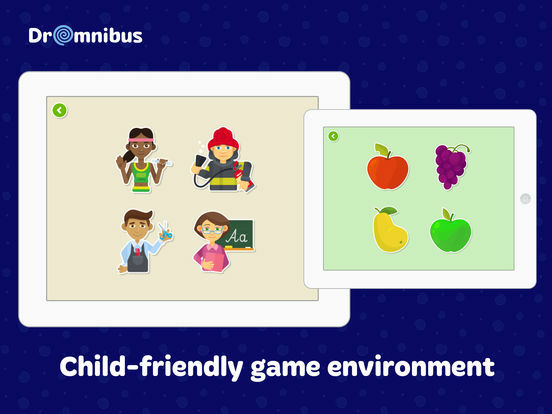 DrOmnibus Inclusive Education is one of the world’s first tools that incorporates Applied Behaviour Analysis (ABA) in the form of a child-friendly app. ABA is the leading method in the therapy of autism worldwide. DrOmnibus Inclusive Education has a free trial period (14 days). We offer the subscriptions for 1 month, 3 months and 12 months. These prices are for United States customers. Pricing in other countries may vary. Purchasing a subscription gives you more than 5000 tasks and new updates, statistics and games, all in one tool with the proven ABA method. Payment will be charged to AppStore Account at confirmation of purchase. Subscription renews automatically unless cancelled at least 24-hours prior to the end of the subscription period. Account will be charged for the regular price of your subscription renewal within 24-hours prior to the end of the current period. Subscriptions may be managed by the user and auto-renewal may be turned off by going to the user's Account Settings after purchase.